The EX-9531 convert is an intelligent, stackable expansion module that connects to a PC USB port or USB Hub via the Universal Serial Bus(USB) port, providing one High-Speed RS-422 or RS-485 serial port(jumperless) The EX-9531 features easy connectivity for traditional serial devices. The RS-232 standard supports full-duplex communication and handshaking signals (such as RTS, CTS) and The RS-485 control is completely transparent to the user and software written for half-duplex COM works without any modification. The EX-9531's Opto-isolators provide 3000 Vdc of isolation to protect the host computer from ground loops and destructive voltage spikes on the RS-422/485 data lines. 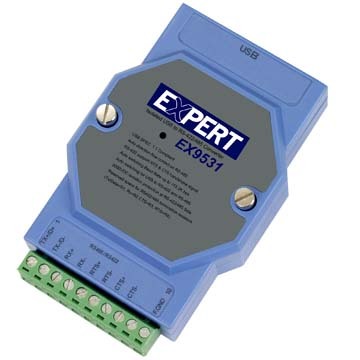 EX-9531 also offer internal surge-protection on their data lines. Internal high-speed transient suppressors on each data line protect the modules from dangerous voltages levels or spikes. The EX-9531 module derives the power from USB port and doesn’t need any power adapter.